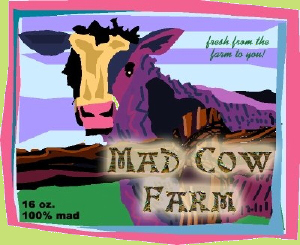 "Mad Cow Farm" appeared on Green Beings' 2004 "Jesus Was a Flexitarian" single. In this terrifying tale, sweet, docile cows are transformed into murderous zombies. Brrrr! The only thing scarier than that is the USDA's inadequate testing for mad cow disease! Good thing this song is just a far-fetched fictional story. To take the chill off, we give you a cheerful calypso groove.